#42 takes it! And Stephanie - I DID receive you're beautiful necklace, and we've been passing it around the studio taking turns wearing it - many, many thanks! Shelly - I'm fine. I actually just needed to take a little step back from work, so I got my nails did, and am going plant hunting today with one of my oldest friends. Elyse Blum; fellow begonia enthusiast, fellow Leo. Hope you find some great plants today! OOH my eyes widened when I read giveaway. Would make my day to win. Keeping my fingers crossed! Last night in the thunderstorm I went by fire and candlelight...then I watched friday night lights on my computer in bed. Its a give and take. Flowers Please!! i'm sorry you had a bad day flowers for my sister. I'd like to win these to send to my newly engaged future sister in law! 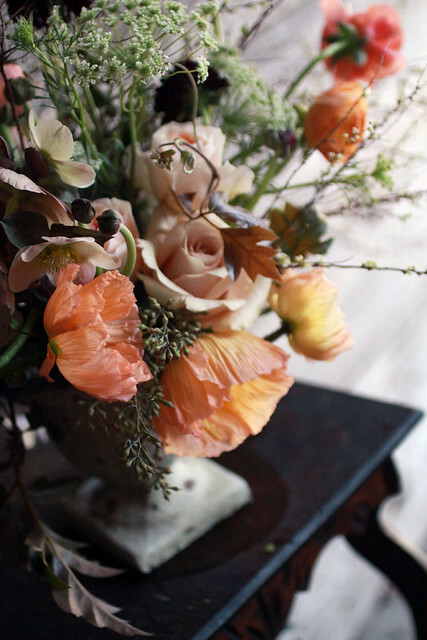 your flowers would sure brighten up this stinky weather in ny! oh my is it thursday already? need some spring up in this b****! i would love flowers from you please and thank you. I, too, cannot believe it's already Thursday! What the whaaaat? Considering how quickly and how much it warmed last spring / summer, I kind of don't mind that we've temporarily slipped back into cool weather again. A spring arrangement would still be greatly appreciated though. where did spring go?? these would be a lovely reminder! Please, oh, please! I could really use some flowers to brighten up this cold & dreary spring. It would be Dream come true! would love to win after being sick for 2 weeks! So pretty! Love the poppies. This arrangement is lovely. It would be great to win! Ooh, plant hunting sounds fun! i know that would brighten my day! Amazing. Looks like a set for a Severin Roesen painting! I almost gave in and bought the saddest bundle of forsythia at the corner store last night. Your flowers would be sooo muuucchh better! Winning lovely flowers would be the highlight of my week! always love trying to win your flowers! Back again trying to win some flowers for my dear friends in NYC! All the potted plants in my small-windowed Brooklyn apartment have died, either due to the winter grayness or my own lack of a green thumb. Either way, it would be truly lovely to have something beautiful blooming in my home to make work (and the unseasonable weather) a little less dreary. Oh so pretty. Such a contrast to last nights weather! oh please oh please pick me! Meeee- I love your flowers! I need me some love. Some good ol fashion flower love. Sarah, Did you receive the necklace I sent you?